Mid July Cato Cassiers and Hannelore Willen participated in the EK Youth Championships in Lithuania (Panevesys). Hanne Peeters was the 3rd female athlete for Team Belgium. The race was split up in 2 parts, with sprint distances (other than “normal” Youth A distances). On Thursday July 13th the semi-finales took place, in 3 different races. Our 3 Belgian ladies give the best they had and were awarded a place in the final, where the 30 best European athletes would compete. The finals on Saturday July 15th were very hard, as from the beginning. A lot of pulling and pushing in the swim part, setting our ladies back, unfortunately. Cato started the biking in a small group of athletes, Hannelore missed this opportunity and had to finish the biking part on her own, very hard indeed. Cato then started the running discipline, while Hannelore lacked the necessary fuel in her finishing discipline. Cato ended 25th, Hannelore 29th, Hanne Peeters finally ended 14th. On Sunday July 16th finally there was the Mixed Team Relay. Cato started first, followed by Thomas Guilmot, Hanne Peeters and Elias Biesemans. Cato used the experience of the finals during the swim and took the lead from the beginning, starting as 3rd in the running discipline. Finally the team ended 13th, well done!! 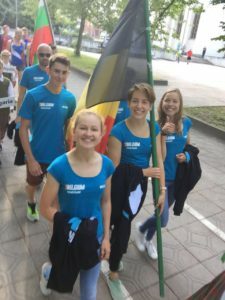 The athletes returned home tired, but with a smile, grateful for this experience, and with a lot of lessons they can use for the Belgian Championships upcoming Saturday July 29th in Sint-Laureins.